We’ve found conclusive proofs to show that Phoenix Trading Software is a scam. William Johnston from Marshall-Sherman Group is promising guaranteed profits with Phoenix Trading Software scam, but it’s all lies. Read our in-depth Phoenix Trading Software review to find out the truth. Phoenix Trading Software scam starts off their sales video with an interesting take – they point out the fact that there are no free softwares that can make you rich overnight (which is true), and then contradicts itself by narrating how Marshall-Sherman Group is conducting a survey on a get-rich-quick trading software. Speaking of Marshall-Sherman Group, it is just a fabricated name used for the marketing of Phoenix Trading Software scam. They claim to have conducted surveys for major brands, so I tried to look for them on Google. There is no information about the group, except for reviews from binary options websites that unequivocally point out that Marshall-Sherman is non-existent. Even though Phoenix Trading Software doesn’t really explain how it works (apart from assuring will profit for you automatically), it is in fact an automated binary trading software. Trading with binary options is extremely risky, and by nature is very similar to gambling. You are risking more money to potentially win a smaller sum (e.g. risking $50 to win $30), and the winning rate for each trade is no better than 50%. It’s just like guessing the outcome of a coin flip, but you bet $50 in hope of winning $30. Due to the unfavorable trading conditions, the vast majority of binary options traders lose money. This gave rise to binary trading robots such as Phoenix Trading Software that promise to place winning trades automatically and generate profits for the users. Unfortunately, there are no softwares that can generate consistent profits for the users. Despite the sugar-coated promises given by Phoenix Trading Software scam, we’ve found conclusive evidence to show that Phoenix Trading Software doesn’t work. In the members area of Phoenix Trading Software scam, you’ll come across the live trade alerts for the alleged members who are making profits using this software. Leon was featured as one of the many members who are making profits from the software. However, this member, along with the others, have been proven to be fake members. 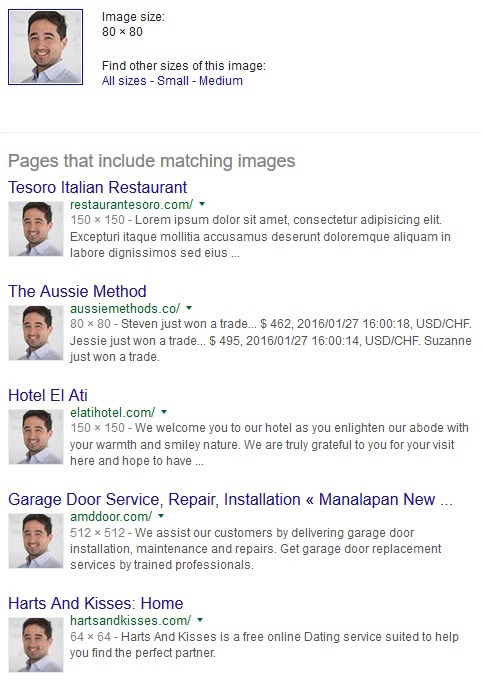 A simply reverse search on Leon’s photo will return results from Italian restaurant, Aussie Method scam, Hotel El Ati, garage door service, and even online dating service. Is he really involved in all these activities? I’ve done a reverse check on the photos of the other members, and all of them turn out to be stock photos, too. 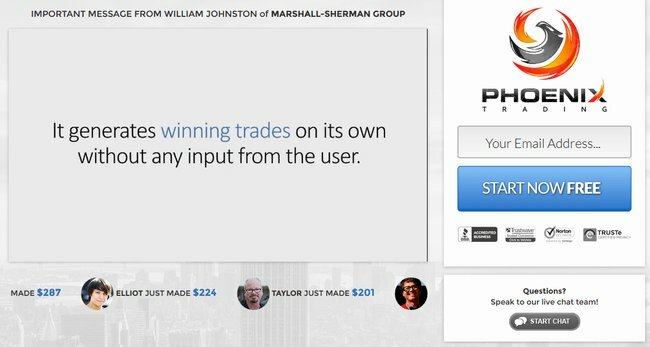 There’s a section within the sales page where Phoenix Trading Software scam displays the Twitter and Facebook posts of Will Johnston and Marshall-Sherman Group, including the interactions of other users. All of these comments are talking about how awesome the software is, so I tried to verify the posts and tweets. The conclusion is – they turn out to be complete fakes, too. If you want to try, you can search for Will Johnston in Twitter or Marshall-Sherman Group in Facebook, only to find that both of them don’t exist at all. Another way to find out they are fakes is to try clicking on the profile pictures, or trying liking and sharing the posts. The buttons will not respond, because the posts are not real. It’s just a lazy attempt by the scammers to try and fool its potential victims by providing social testimonials, and to make it seem more reliable. In the member’s page, you will need to fill in your personal details such as your name and phone numbers to start using the software. There’s a timer that counts down as William Johnston encourage you to sign up for the software. Why the rush? Although William reasons that your spot is only reserved for 5 minutes, he is actually lying to you. There’s no real reason to rush you through. The countdown timer is there to create an illusion of scarcity and limited time offer. By placing a countdown timer, it will force a few more impulse sign ups. How to know if the countdown timer is fake? It’s simple. You can just refresh the page and the timer will be reset to 5 minutes. Or, you can wait till the time runs out, and find that you can still sign up for Phoenix Trading Software just fine. However, I wouldn’t encourage you to give away your personal information, because your information will be submitted to an affiliated broker of Phoenix Trading Software scam, and you will receive annoying sales calls forcing you to make a deposit. Despite giving you promises of guaranteed profits, Phoenix Trading Software is going back on its words, and refuting every promise given to you inside its disclaimer. You can verify the authenticity of this disclaimer by clicking on the “Disclaimer” fine print at the bottom of Phoenix Trading Software sales page. Despite coercing you to sign up for the software, you should not view Phoenix Trading Software as an invitation to trade binary options. If you do sign up, it’s entirely your own decision. Note: Scams like Phoenix Trading Software that promise exorbitant returns are illegal in many jurisdictions. If they do not include this clause, they are deemed to illegally coerce you into signing up for the scam. Despite promising you guaranteed profits, it’s your own fault if you use Phoenix Trading Software and lose all your money. NO trades have been executed using Phoenix Trading Software. All results shown are simulated. Fact #3 alone should be enough to alert you to steer clear of the scam. Can you trust a product that reports fabricated profits and claim them as real? Is Phoenix Trading Software a Scam? YES, PHOENIX TRADING SOFTWARE IS A SCAM. As we’ve said in the review earlier, we don’t recommend binary options trading as a way to make money online, at all. It’s not that different from gambling, and using an automated trading software is no different. You are essentially putting your hopes and entire investment in a piece of software that gambles on your behalf.